This article is about The Groundlings comedy club. For a person called a groundling, see groundling. The Groundlings are an improvisational and sketch comedy troupe and school based in Los Angeles, California. The troupe was formed by Gary Austin in 1974 and uses an improv format influenced by Viola Spolin, whose improvisational theater techniques were used by Del Close and other members of the Second City, located in Chicago and later St. Louis. They used these techniques to produce sketches and improvised scenes. Its name is taken from Shakespeare's Hamlet, Act III, Scene II: "...to split the ears of the groundlings, who for the most part are capable of nothing but inexplicable dumbshows and noise." In 1975 the troupe purchased and moved into its current location on Melrose Avenue. The Groundlings School holds new sessions every six weeks with over 300 students per session, with more than 2,000 students per year going through the program. The competitive program, with admission by audition, consists of 5 levels (Basic, Intermediate, Advanced Improv, Writing Lab and Advanced Lab). Participants must satisfy instructors in order to advance. The program takes years to complete, as 18-month to two-year wait-lists between upper levels are common. Students may be asked to repeat Basic and Intermediate classes multiple times. By the late 2000s, students had one chance to complete classes in Improv and Writing. Failure to pass either of these classes means a student cannot complete the program, nor be invited into the Sunday Company. Students may be voted into the Sunday Company, where they may remain no more than two years. Many move on sooner than that. Many Groundlings performers have found success in movies and television, including several who have become cast members and writers on Saturday Night Live, MADtv, and Reno 911! In 1972, Gary Austin (a veteran of San Francisco's "The Committee") assembled a group of performers in Los Angeles who just wanted to work on their craft. Together they would improvise, perform monologues, scenes, characters, songs, dances, and classic plays. After about a year, they started doing performances and inviting friends to come and watch. Word got out about the workshop, more people started coming, and soon a core group of performers began to showcase their material at various venues around Hollywood. In January 1974, Austin announced that he wanted to create a theatre company. There were fifty founding members of the company (membership at that time required payment of $25 to attend workshops). They developed material in the workshops and performed the best pieces in the weekend shows. This new group produced its first show in the 30-seat basement of the Oxford Theatre (now The Met) near the corner of Santa Monica Boulevard and Western Avenue. Esteemed LA Times theatre critic, Sylvie Drake, was in the audience that first weekend, and wrote a rave review. "This could be the start of something big," Drake predicted. As the buzz about the new company increased, the entertainment industry started taking notice. Comedian Lily Tomlin was a regular in the audience, and she hired several Groundlings to perform on her eponymous The Lily Tomlin Show. Later that year, Lorne Michaels, who produced Tomlin's TV special, asked Groundling Laraine Newman to be a cast member for his new late night comedy series Saturday Night Live. Before long, membership in the company grew to 90. To keep the size down, the company required selection by audition. (Phil Hartman, then a graphic designer, tried out in the first audition. He was accepted but, due to the stiff competition, he had to wait more than a year before starting to perform in shows.) With such a large company, workshops seven days a week, and sold-out shows going up three nights a weekend, The Groundlings needed a place to call their own. The Groundlings School of improvisation officially began in 1978 with 17 students and staff members Gary Austin, Tom Maxwell, Phyllis Katz, Cherie Kerr, Laraine Newman and Tracy Newman. In the 21st century, it has an annual enrollment of more than 4200 students. The Sunday Company was formed by Suzanne Kent in 1982 to further develop the talent coming through the school. In 1975 the company acquired what became The Groundlings Theatre at 7307 Melrose Avenue (the building was previously used as an interior decorator’s studio, a furniture showroom, a gay bar, and a massage parlor). Through equity and with the use of their own funds, company members set out to modernize the building and convert it into a performance space. They battled through four years of red tape, building codes, and parking restrictions before producing any shows on the stage. During that time, The Groundlings performed their revues at a handful of theaters all over town, including The Improv, The Matrix, The Hollywood Canteen, and the White House. Finally, in April 1979, the revitalized 99-seat theater opened its doors to audiences. In November 1979, Gary Austin stepped down as artistic director. Tom Maxwell was elected as his successor, and he served for the next ten years. In 1989, The Groundlings began the enduring tradition of having Groundlings or Groundlings alumni direct each new revue. The Main Company of no more than 30 members, collectively makes artistic, business and creative decisions. In April 2017 Groundlings paid tribute to passing of their founder, Gary Austin, by gathering at the theatre and laying flowers at his plaque. Students must pass an audition to get into Basic class. Auditions are run by a Groundlings teacher and are mini versions of a first day of class. The audition is free, a group audition, and is all improvisation. Auditions are held every week and can be scheduled online. If one does pass the audition, their results are valid for one year. If a student does not pass the audition, they are allowed to audition again in four months. Students are allowed to audition a total of three times. After completing the Advanced Lab level, a student may be voted into the Sunday Company, which performs every Sunday at 7:30pm. During this time, students write, rehearse and perform new material every week. After six months of performing in the Sunday Company, students are either voted to remain in the company for another six months, voted to be dismissed from the school, or voted into the Main Company (aka The Groundlings). No one can stay in the Sunday Company for longer than 24 months nor less than six months. All members of the Main Company are selected from members of the Sunday Company. All Main Company members can remain in the company for as long as they desire. Usually members do not stay for longer than a decade; most Groundlings retire sooner from the company. The Main Company (capped at no more than 30 members at any time) collectively acts as the organization's artistic director, democratically making business and creative decisions as a group. The Groundlings Revues (now commonly referred to as the Main Shows) were the first shows performed by the company and they established the Groundlings improv, character, and sketch comedy style. In 1981, the revue was given a title, "L.A. 200, Groundlings 3". From that point on, every revue would have its own name, and have the word "Groundling" in the title. Initially, one or two revues were performed in a year, increasing to three by the 1990s, and four in 2007, in addition to a special holiday show in December. Main Shows are performed every Friday at 8:00 p.m. and every Saturday at 8:00 p.m. and 10:00 p.m. In 1992, Melanie Graham created Cookin With Gas, a weekly short form improv show performed by Groundlings, Groundlings Alumni, Sunday Company members, and special celebrity guests. The show continues every Thursday night at 8:00 p.m., and is now the longest running improv show in Los Angeles. It was followed in 2001 by the long-form improv Crazy Uncle Joe Show, which runs every Wednesday night at 8:00 p.m. Starting in 1981, the company added alternative format shows to the theatre's regular line-up. The first one was The Pee-Wee Herman Show, created and co-written by Paul Reubens as a showcase for his Pee-Wee Herman character, which he created in Groundlings workshops and revues. Pee-Wee and his friends (played by and co-written by other Groundlings like Phil Hartman, Lynne Marie Stewart, John Paragon, Edie McClurg, and John Moody) started performing Saturdays at midnight, after the regular revues. Quickly, the show became a huge LA hit; it transferred to The Roxy Theatre on Sunset Blvd and was filmed for an HBO special. In the following years, Pee Wee became a pop culture icon, spawning films, toys, and a children's television show. An updated revival of the original stage show (with many of the Groundlings reprising their roles) had a successful run in Los Angeles' Nokia Theatre and in New York on Broadway at the Stephen Sondheim Theatre on November 11, 2010. This production was filmed for another HBO Special. Groundlings cast on Saturday Night Live and Mad TV have often adapted their sketches and characters developed at The Groundlings into TV audience favorites. 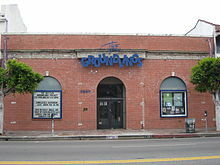 Former members of The Groundlings have further developed such materials into shows and films, such as Pee-Wee's Big Adventure, Pee-Wee's Playhouse, Austin Powers: International Man of Mystery, Elvira, Mistress of the Dark, A Night at the Roxbury, and Romy and Michele's High School Reunion. In 1998, the Groundlings were given an improv television program on the F/X network called Instant Comedy with The Groundlings. In September 2008, The Groundlings began producing short-form sketch episodes for Crackle. In 2006, The Groundlings recorded a skit called David Blaine Street Magic performed in the alleyway behind the theater. After being uploaded to YouTube, it has become one of the most popular videos on the website. As of October 2014, the video has had more than 38 million views and 60,000 comments since October 12, 2006. The skit stars Mitch Silpa parodying David Blaine in both the topics of Blaine's performances and his mannerisms. The skit is written by Michael Naughton and Mikey Day, who play the two innocent bystanders on whom Blaine performs his tricks. ^ "GARY AUSTIN WORKSHOPS – NEW YORK CITY". garyaustinworkshops.com. ^ Fult, Josh (February 19, 2007). "Gary Austin – Part 1 – 2/19/07". Improv Interviews. Retrieved July 19, 2010. ^ "Shakespeare's Audience: The Groundlings". Shakespeare-online.com. 2000-08-20. Retrieved 2013-01-08. ^ Gary, Austin. "Groundlings History". groundlings. Groundlings. Retrieved 1 December 2016. ^ Gonzalez, Richard (4 April 2017). "Gary Austin Dies". NPR. Retrieved 8 May 2017. ^ "Groundlings School Information Page". Groundlings.com. Retrieved 2013-01-08. ^ "The Pee-wee Herman Show Broadway @ Stephen Sondheim Theatre - Tickets and Discounts - Playbill". Playbill. ^ "HBO to Film Broadway's The Pee-wee Herman Show for Subsequent Broadcast - Playbill". Playbill. ^ TV.com. "Instant Comedy with the Groundlings". TV.com. ^ "Crackle Launches New Original Programming". PRNewswire. 2008-09-11. Retrieved 2009-02-25. ^ "david blaine street magic - YouTube". www.youtube.com. ^ "Groundlings", LA Times: Entertainment, 22 June 2008. Collected 9 October 2008. ^ David Blaine Street Magic at YouTube. Collected 26 April 2011. ^ a b c d e Liner notes, 7307 Melrose Ave CD. 1996, rip hummer music (634479552052). ^ a b c d e f g h i j k l m n o DIG THE GROUNDLINGS; L.A.'S PREMIER IMPROV COMEDY TROUPE CELEBRATES 25 YEARS, Los Angeles Daily News, September 24, 1999. ^ "Groundlings website, alumni list". Web.archive.org. 2007-07-31. Archived from the original on July 31, 2007. Retrieved 2013-01-08. ^ From Takeshi's Castle to MXC: Most Extreme Elimination Challenge!, BBC, August 18, 2004. ^ a b When Groundlings Attack, Backstage West, February 22, 2001. ^ a b 'Hostage' pushes Alliance's limits, Los Angeles Times, June 27, 2003. ^ a b c d Groundlings going digital, Variety, April 21, 2008. ^ The Groundlings: improving improve in L.A. for 40 years., L.A. Times, May 24, 2014. ^ Burton, Tim. Burton on Burton. Faber & Faber, 2006, ISBN 0-571-22926-3, p. 47. ^ "CBS network website ''Alex Kapp Horner''". Web.archive.org. 2008-07-24. Archived from the original on July 24, 2008. Retrieved 2013-01-08. ^ "John Kilfudd resume". Resumes.actorsaccess.com. Retrieved 2013-01-08. ^ Nancy Cartwright Chats with Tress MacNeille, Animation World News, December 18, 2008. ^ It's Edie in Here, Back Stage West, October 30, 2003. ^ Groundlings prove comedy is all about teamwork, Daily Trojan, July 2, 2008. ^ COMIC 'GROUNDLINGS' HAS ROOM FOR IMPROV-MENT, New York Daily News, September 7, 1998. ^ Just Shoot Me Official Site Archived 2011-06-05 at the Wayback Machine, Sony Pictures Television. ^ In Praise of Silliness – Los Angeles' own Groundlings are celebrating two decades of, well, just plain silliness. Is this someone's idea of a joke? You bet and it's paid off, Los Angeles Times, September 18, 1994. ^ Groundlings sputter, singe, Los Angeles Times, December 12, 2003. ^ a b Barnes, Mike (2016-08-19). "Cynthia Szigeti, Groundlings Improv Teacher and 'Seinfeld' Actress, Dies at 66". The Hollywood Reporter. Retrieved 2016-09-06. ^ "The Groundlings". The Groundlings Website. ^ , Q&A: Kathy Griffin (The Hollywood Reporter). ^ "Life's That Way – About Cecily Adams". Lifesthatway.com. Retrieved 2010-11-05. ^ Interview with Joey Arias, Bowie LiveChat, March 18, 1999. ^ a b c d "The Groundlings". The Groundlings Website. ^ "The Groundlings and Improv in L.A". Trazzler.com. 2008-05-24. Retrieved 2013-01-08. ^ Eliza Coupe – Ten Comics to Watch, Variety, July 17, 2006. ^ Live From New York: Introducing New SNL Star Abby Elliott, People magazine, March 9, 2009. ^ Jimmy Fallon's pleasant tomorrow, USA Today, October 7, 2004. ^ "bob flanagan, 1952-1996". Hnv.nin.net. Retrieved 2010-11-05. ^ "Del Mar's Own Taro Gold". The Del Mar Times. Main Street Communications. November 2005. pp. 11–12. ^ "Groundlings, The - ProductionHUB". ProductionHUB.com. ^ Virtel, Louis (4 March 2010). "Was Kathy Griffin's Censored SVU Scene Payback from an Injured Mariska Hargitay?". ^ Administrator. "Star Trek: Of Gods and Men". startrekofgodsandmen.com. ^ "The Official Website of Heather McDonald". heathermcdonald.net. ^ "Sunday Company". Groundlings. Retrieved July 14, 2014. ^ Oscar Nuñez "Accounts" for The Office's Success, TV Guide, May 10, 2007. ^ Conan O'Brien Biography, A&E Biography. ^ Q&A with Kaitlin Olson, Oregon Daily Emerald, August 20, 2007. ^ "''Lou Romano bio''". Louromano.com. 2007-06-25. Retrieved 2013-01-08. ^ Famous Michiganders Archived 2006-08-14 at the Wayback Machine, Outdoor Michigan. ^ "Building Character From the Ground Up". Articles.latimes.com. 1991-01-11. Retrieved 2013-01-08. ^ "Dan Schneider - Nancy Sullivan - DanSchneider.com - DanWarp". www.danschneider.com. ^ CC Swiney, Ultimate Improv. ^ Meyers, Lawrence (June 2, 2010). Inside the TV Writers' Room: Practical Advice for Succeeding in Television. Syracuse University Press. p. 57. ISBN 0-8156-3241-X. ^ Feimster, Fortune. "Fortune Feimster's Bio". Fortune Feimster.